Let's talk hair, shall we? Just wanted to update you all on the relationship I'm having with my hair these days. If you've noticed, in the last several posts on this here blog, my hair has been curly. I haven't straightened my hair at all this year. One of my resolutions for 2013 was to not straighten my hair nearly as much as I did last year. I realize that I was straightening my hair because I was getting exasperated with it in it's natural state, and I still wasn't loving it straight! I felt when I wore my hair in a braidout, twistout, or wash-n-go that it was just sort of there. Because my hair was a blunt cut, it made my hair look outstanding straight--however, it was just boring when curly. So I decided that I would do whatever I needed to do to love my curly look again, because it is actually my favorite way to wear my hair. For quite some time, I had been resisting changing the cut/shape of my hair for fear of how it would look when straightened, but straight was how I actually wear my hair the least. It just didn't make sense to let that keep being a factor into how I styled my hair. So the first change I made was to lighten my hair up some. I'd been wearing black hair for a while, but I actually think curly hair looks better lighter (or highlighted). Black hair tends to look like one big mass, whereas if the hair is lighter or has highlights, you can see some of the curl pattern and it gives the whole look more definition. Second, I slightly layered my hair--nothing dramatic at all, but it makes a difference in the look. Finally, I just recently cut "bangs" again. I put bangs in quotes because if straightened they are below my chin, but while curly it makes my hair frame my face really nicely. So now I'm back to feeling like me again. The pics above are before I added the bangs, but I will be posting an outfit post shortly that shows them. They are still fairly long while curly too, so maybe I shouldn't call them bangs, and instead call them face-framing-layers. Tomato, tom-ah-to. Either way, I'm a lot happier. BTW, don't forget to enter the giveaway! Love your hair! I can't seem to embrace my curly hair. 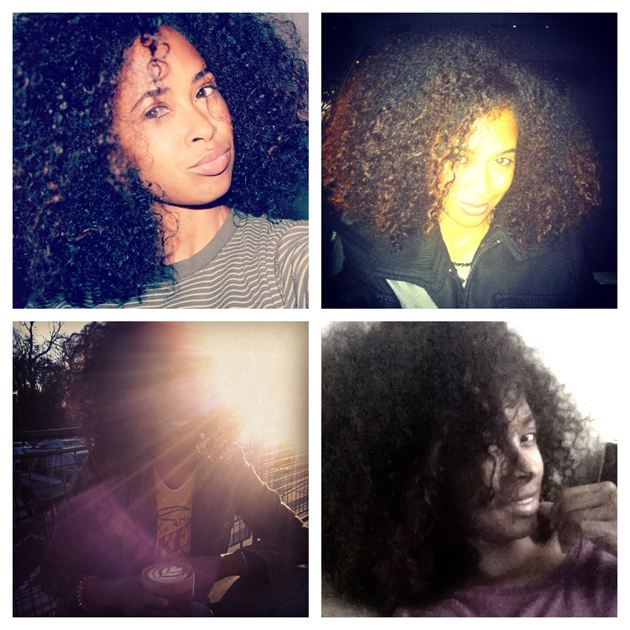 I wear it curly at least once or twice a month but for the most part, I'm blow drying it out. It's to hard to maintain my hair when its curly! I guess its laziness...I don't know. Anyway your curl pattern is fab! Its so true about the curls popping with highlights. I made the mistake of dying my hair black and I cant see any of my curls :(. Do you think you curl pattern has changed from straightening it so much? You are so gorgeous, I just love you. I love what you did with your hair and agree with saying the hell with cutting/trimming based on how it looks when straight. That cut is your signature and is so fly. It does make me anxious since I want that look but.....siiiiigggghhhh. Damn. Hair is one of the basic compounds of a good look. Taking care of it should be your everyday ritual. I am always looking for the natural products, because initially I am opposed to all kinds of chemicals. I use herbal shampoos, oils, eggs, yogurt and many other products as external remedies. In the same time, I consider my nutrition and fill my eating plan with useful foods. Besides, in autumn and spring I try to take additional vitamins. Recently I have found a nice nutritional supplement, which is most natural of all I have tried before. It’s Hair Gain Formula, manufactured by Military Grade. Together with it, all other actions which I take provide perfect results not only for my hair, but also for my skin and nails.